This past year has been interesting for many reasons. Not only did we get married and move to a new city, but we started this crazy marriage blog and decided we weren’t going to buy any new clothing for the whole year. While it has been interesting on many accounts, this last one has challenged us in many ways. As we were coming home from our flea market trip last week, we started discussing what we will buy once our year is up, what clothing we wished we could have bought in the last ten months (not much came to our minds) and how it will change our buying habits in the future. As we were thinking through the process of buying used clothing, it struck me that it’s sort of like making sushi. Remember the post a few weeks ago? The most difficult part of making sushi is finding the initial ingredients in your store. Once you know where they are, you can make them part of your grocery list, pick them up quickly, and make sushi part of your life on a regular basis. The same could be said for thrifting. It can be super frustrating if you spend all your time searching for the things you want. But once you find those few perfect places, the odds of you finding something you love increase greatly. You can make more regular trips to a few shops, spending more time choosing between great things instead of desperately digging for anything worthwhile. This has spurred more conversation about our next year. Should we make a new pledge? Not buy anything new for one year? Buy only clothing new but nothing else? What’s one thing you would never buy used? 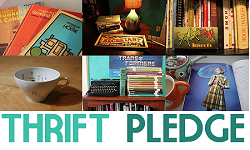 Also, click the Thrifty Pledge below for a link to one of our favorite thrifters. I couldn't buy my unmentionables from a thirft store. I also couldn't buy socks- i have feet issues. Thank you for the kind mention you two! I DARE you to go one year without buying anything new. I am suffering no withdrawal symptoms a quarter through the year, actually, avoiding retail shopping is more liberating than anything else for me.